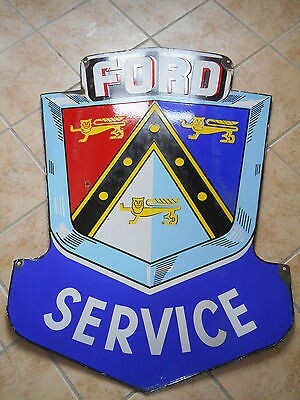 This great looking Ford Service Die Cut Crest porcealin sign is 47″ by 32″. The sign is dark blue, light blue, and has the words “Ford” at the top and “Service” at the bottom. In the center of the sign is a crest that is divided into three sections. Within each section is a yellow lion facing left.